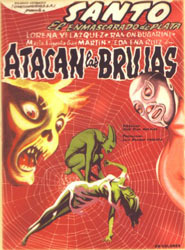 Santo comes in contact with Ofelia (María Eugenia San Martín), who has a reoccurring dream of being attacked by band of witches and rescued by Santo. Santo looks into the matter and discovers that her house is the home of Myra (Lorena Velázquez), Queen of the Witches. Myra needs to sacrifice Ofelia soon, or else the Prince of Darkness will be very upset with her. Will Ofelia’s dream come true, or will she and Santo be sacrificed to the forces of evil? The Witches Attack starts off with strange sequence in which we catch Santo in mid-rescue attempt, as he scales a wall into a creepy mansion, looking to free a young woman, Ofelia. He’s soon overpowered by three goons and chained to a table. The Queen of the Witches and her entourage approach, intent on sacrificing Ofelia and Santo. Santo bursts from his chains and forms a cross with his arms, forcing the witches to flee. The woman wakes with a start; it was all a dream. Santo films tend to be more straight forward, so it’s unusual (and welcome) to start in such a fashion. A number of traditional haunted house elements start seeping into the story at this point, as Ofelia must stay in her now-deceased parents’ house for one year to collect her inheritance. There are cobwebs, coffins, illusions and witches wearing sparkly bikinis trying to seduce Santo. There is a kind of subdued gloom about the entire film which keeps some of the more outrageous elements from seeming too silly… well, mostly. Much like Judge Dredd, we learn that Santo rarely if ever takes off his headwear, even to sleep. I did enjoy the fact that Santo is out of his depth regarding the more blatant supernatural elements. Sure he can punch a thug in the head and then bodyslam him, but throw one teleporting seductress his way, and he’s just as confused as anyone else. I think giving him opponents he can’t just suplex away is effective way to keep some dramatic tension going. You know Santo is going to prevail, so the question has to become how? I think I saw this scene in Ghostbusters. It becomes apparent that The Witches Attack is basically a remake of Santo vs. the Vampire Women (1962) albeit cheaper and less well constructed. The witches hate sunlight, fire, and crosses just as much as any vampire. They even turn into bats. The fights aren’t spectacular but they get the point across. There is an inserted wrestling match about half way through the film, but it is edited quickly and even has footage sped up, so the viewer can get back into the story soon enough. This is a middle-of-the-road Santo film; the opening and Santo’s repeated assaults by the witches are some of the best parts. The story is muddled and the repeated dream sequence does little but rob the climax of any energy. Not the worst Santo film by any stretch, but there are better ones.